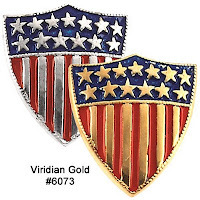 Now you can wear more than just an American Flag lapel pin to express your patriotic feelings about our country! We have added several colorful new pins with flag motifs, as well as pins with traditional written expressions of God and Country. 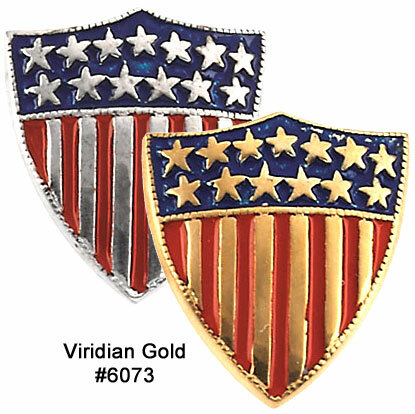 For instance, an old-fashioned American shield design echoes the stars and stripes in a unique, enameled 14K Gold lapel pin, the #6073 "American Shield of Honor" pin, shown to the left. 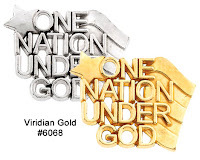 Another design is our "One Nation Under God" Lapel Pin, which allows you to wear the sentiment expressed in the words of our Pledge of Allegiance to our flag: I pledge allegiance to the flag of the United States of America, and to the republic for which it stands, one nation under God, indivisible, with liberty and justice for all." 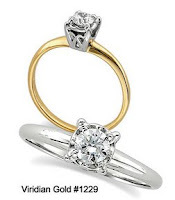 It is available in 14K white and yellow gold, as well as a more economical 10K yellow gold version. 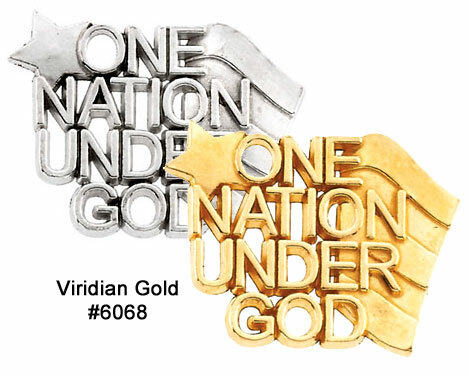 Find these designs and many, many more in the Patriotic Lapel Pins section of our Viridian Gold website.